The village of Theddlethorpe is situated on the coast between Mablethorpe in the south and Saltfleet in the north. 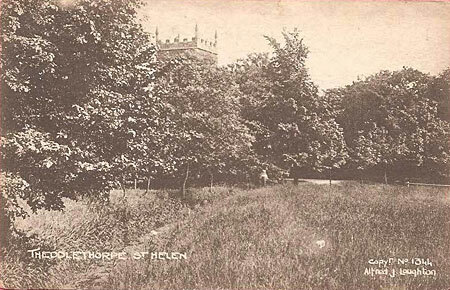 Within the village there are two parishes All Saints and St. Helens. 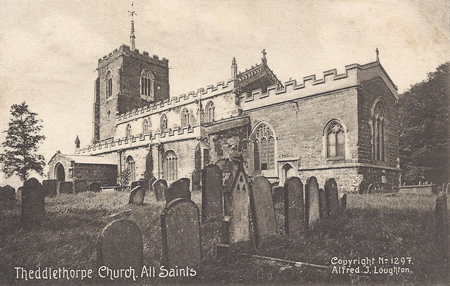 In the early 1800's All Saints was known as Theddlethorpe West and St. Helens as Theddlethorpe East. The railway station originally opened on 17th October 1877 and closed 83 years later on the 3rd December 1960. 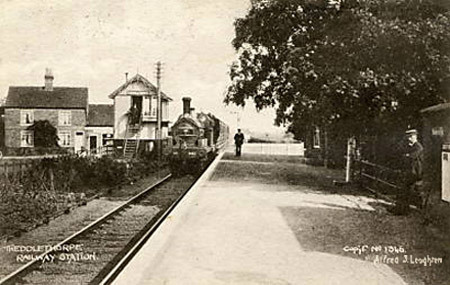 Theddlethorpe station was on the Great Northern Railway Mablethorpe Loop between Mablethorpe and Saltfleetby. The South Porch, All Saints Church, Theddlethorpe, Lincolnshire. The church is now in the care of The Churches Conservation Trust and is locally called 'The Cathedral of the Marsh'. 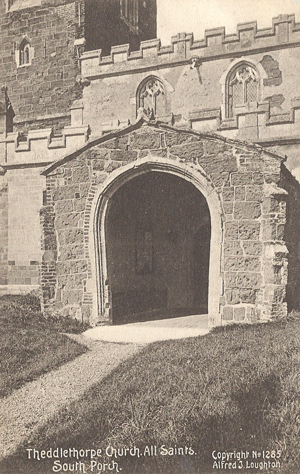 The church is mostly of the 14th and 15th centuries, although its Norman origins are apparently evident. A view over the graveyard towards the south east corner of the church. From a printed postcard. 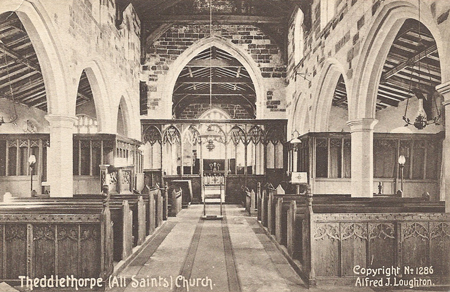 The interior looking towards the alter, All Saints Church, Theddlethorpe, Lincolnshire. 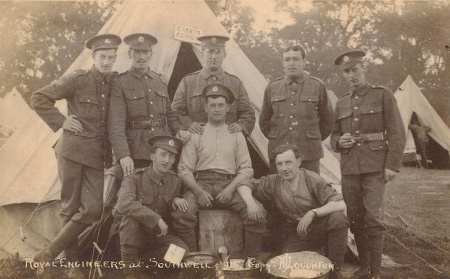 From a printed postcard. 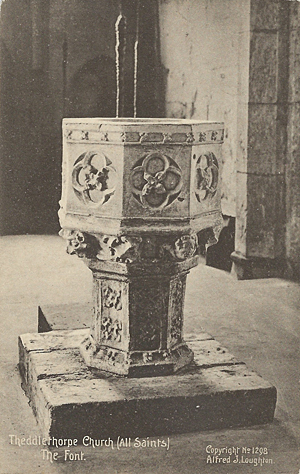 The font, All Saints Church, Theddlethorpe, Lincolnshire. From a printed postcard. 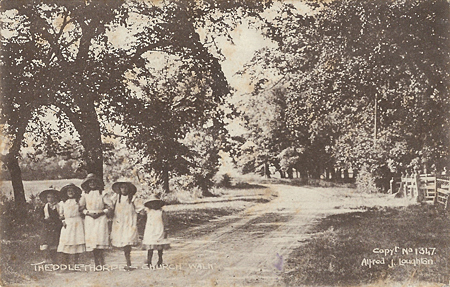 A group of children making their way along Church Walk, Theddlethorpe, Lincolnshire. From a used, but unfranked postcard. The stamp is a King George V ½d (halfpenny), therefore it was most likely posted between 1st January 1912, when the stamp was first issued, and 3rd June 1918 when the postcard rate increased to 1d. 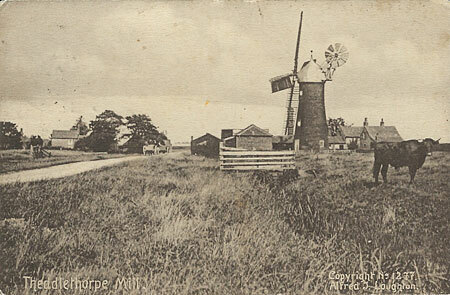 A postcard posted to Shipley Glen near Bradford by George who was staying with Mrs Evison, Sea Bank Farm, Theddlethorpe. This is the second of Alfred's postcards that I've read that has reference to it being very windy in Lincolnshire! 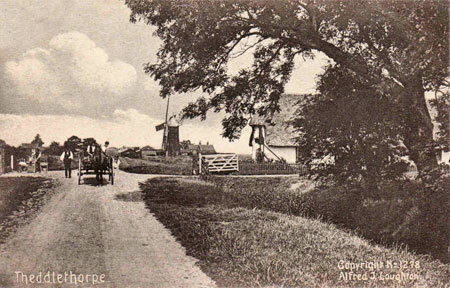 A great rural scenic of Theddlethorpe Mill and a working horse and cart. A rural path with the church tower rising above the trees. 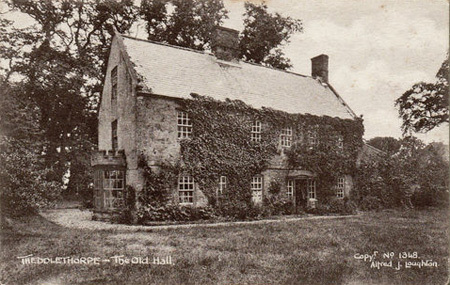 From a postcard posted in 1913. 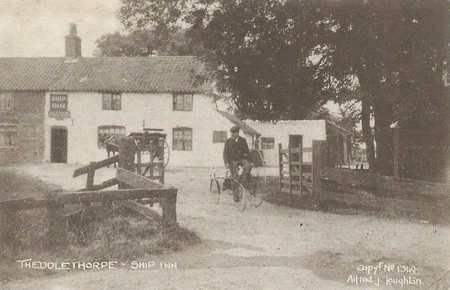 The Ship Inn, sadly no longer an inn, mouse over the image to see how it looks now. 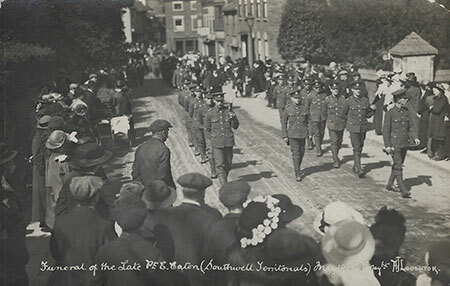 Both images kindly supplied by a resident of Theddlethorpe - Mr David J B Sear. 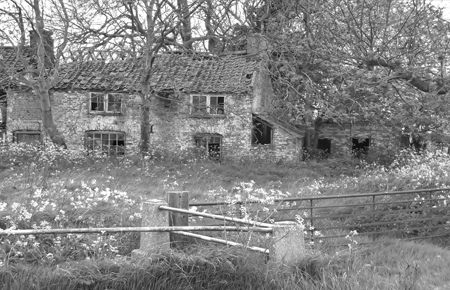 The Lost Pubs Project featuring another photo taken at about the same time. 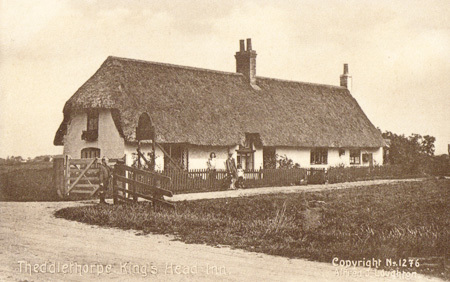 The thatched King's Head Inn.